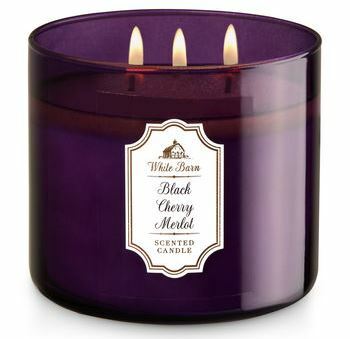 Full disclosure, I am not a fan of cherry scents and usually steer clear of anything with cherry in it, and that includes blends. To me, cherry smells like cough syrup no matter how well blended. That’s just me and my nose… I know plenty candle lovers who love it. With that said, why did I purchase Black Cherry Merlot? I have no idea. It was on sale? I was curious? It was White Barn? Take your pick or all of the above. Dark cherry, black raspberry, sumptuous merlot. First impression… the aroma was very nice and pleasantly surprised me. I smelled dark cherry and raspberry the most. It was sweet and reminded me of preserves or jam. And guess what? No cough syrup in sight. Hoping that sticks as I burn the candle. Time to find out!! I lit this candle in my master bedroom and within minutes of lighting the wicks, the fragrance began traveling all throughout my bedroom. The aroma… I smelled equal parts black cherry and sweet raspberry with something else in the mix I’m guessing had to be the merlot. Whatever it was, it added a bit of sophistication to the overall scent and it was really pretty. Strength – I would rate this candle an 8 out of 10. It gave a pretty decent scent throw in a large room so 10 out of 10 in medium and smaller rooms. This candle burned great. No wick issues, thank goodness. Clean burning from start to finish. Can’t believe I’m saying this but I really enjoyed Black Cherry Merlot and would totally purchase it again. If you aren’t a fan of cherry scents like me, definitely check out this scent next time you’re near a Bath & Body Works store. I think you’ll like it. And just an FYI… if you don’t see this scent listed on Bath & Body Works website, try their stores which tends to carry more fragrances than online.